Copper cookware has a long association with world-class cooking (think Julia Child). 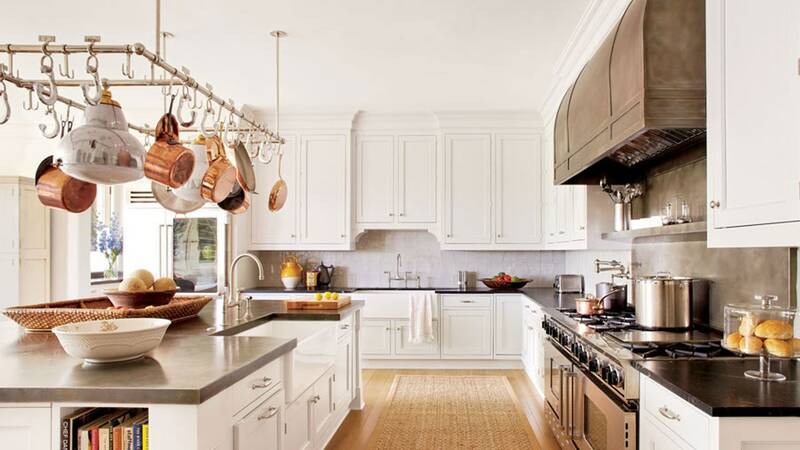 And as copper experiences a renaissance in design right now, people are snapping up copper pots and pans to bring warmth and a gorgeous sheen to the kitchen. But while copper, which is considered a soft metal, is prized for its ability to conduct heat, it requires a little more TLC than other materials, so it’s important to learn how to clean copper. “Depending on the lining of one’s copper cookware, it’s possible to make mistakes when cleaning,” says Mac Kohler, of Brooklyn Copper Cookware. But when your pots are well cared for, they pay off in decades of use and beauty in the kitchen. Copper pots are generally lined with stainless steel or tin. Either way, use a soft sponge to wash them with a gentle dish soap and warm water. Keep it gleaming by polishing it. Left alone, copper naturally tarnishes over time. To polish it, regularly apply a specialty copper cleaner or a homemade mixture of lemon juice and baking soda, vinegar and salt, or lemon and salt. Combine lemon juice (or vinegar) with baking soda and stir until mixed completely. Apply to the surface and buff using a soft cloth, then rinse and dry. Cut a lemon in half and apply table salt to the cut section. Rub the lemon on the surface and add more salt as needed. Create a paste using vinegar (or lemon juice) and salt. Tara Steffen, marketing manager at French copper-cookware manufacturer Mauviel, warns against putting copper in the dishwasher or picking up a stronger cleaner that contains bleach. In fact, avoid abrasive products altogether—even if they advertise themselves as safe, they can score stainless steel and tin, says Kohler. Never heat a dry pan. This rings true for almost every type of pot: When heated empty, without food or a fat like olive oil, the lining can degrade. “Generally speaking, one uses copper cookware low and slow, meaning it’s the metal of choice for delicate preparations,” says Kohler. Notice some damage? “In the case of a tinned pan, the solution is to re-tin the pan,” Kohler says. Stainless-steel pans, however, cannot be brought back to life.